My brother, the blustery-and-favored one who was older by nine years, once said that skin and vinyl stick together like dollar bills to a stripper. I didn't know at the time what a stripper did or where the bills would stick, but I did know firsthand that vinyl car seats stuck to any skin that was bare. My blustery-and-favored brother's knowledge of girlie shows was limited to the Maine State Fair, thirty minutes from our house. This fair drew furtive- and guilty-looking males from behind their Rotor tillers, hoes, and rakes to the only type of event that featured the only type of dancers who had the power to make my mother behave like herself in public. "I'll have no son of mine gawking at strippers. There's no need of women dancing around like that, and I have half a mind to tell them so myself," she snapped one late September evening between gritted teeth at the teenage son she dragged across the parking lot by the ear. She'd already pinched both his cheeks, and he wore her disappointment on his face like misplaced blush. "They're nothing but tramps and hussies. Now get in the car before I wring your neck." She slapped at his chest and shoulders in stops and starts. The youngest of nine, I often watched my siblings as they received their lessons. Never sorry for anything but getting caught, they tensed their muscles, tucked their chins to their chests, and hunched their shoulders as they endured, much like apes in a tropical downpour. From my spot on the perimeter of the family in the days when I was still cute and innocent, I wondered about "need" and "knowing better" each time my parents shouted things like "there's no need of that" and "you know better." I'd feel darts of shame for wanting to see what went on behind the plywood walls that were painted with pictures of jutting-breasted women who dressed as Wonder Woman might if she were going swimming. What did these tramps and hussies do that caused men to line up and wait, that gave these women so much power? I'd learned shortly after birth that men didn't expect to wait for anything, especially their meals, their cigarettes, the bathroom, or the screwdriver they yelled for while holding pieces of metal or wood together. I wanted to know the difference between a hussy and a superhero, and I wanted to know why we sometimes found my father outside those walls, claiming when we'd found him that he'd gotten lost. 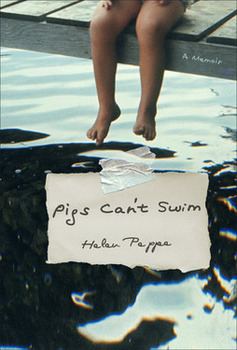 Even though Pigs Can't Swim is a memoir written by a grown-up looking back, the unblemished trustworthiness as a kid looking at it for the first time is right there, wide-open, hiding nothing. I love this book. 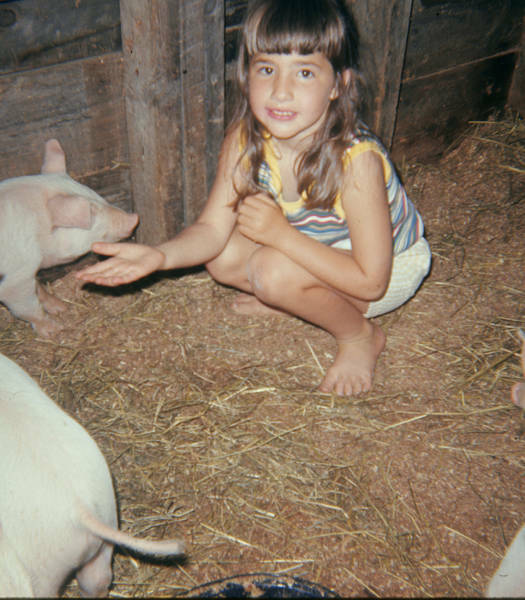 Carolyn Chute, author of The Beans of Egypt: Maine and Merry Men Pigs Can't Swim is a marvelously funny, moving and spirited memoir, likely destined to become a classic in the genre. What's particularly striking are the notes of humor and irony with which she tells her tale, a tale which is, ultimately, the author's search for freedom from the forces of ignorance around her. David Mura, author of Where the Body Meets Memory Pigs Can't Swim is a bracingly honest account of a troubled rural childhood inside a large New England family forced to scratch out a borderline existence on the poverty line in the last house on a dead end country road. The book is brimming full of poignant human narratives that verge on the tragic, vividly and expertly rendered, but it's also filled with redemptive accounts and empathetic love stories about the natural world and the creature world—dogs, horses, pigs—those wide-eyed companions who provide comfort along the way to those who are powerless to escape their circumstances. Debra Marquart, author of The Horizontal World: Growing Up Wild in the Middle of Nowhere An impressive and memorable debut. Suzanne Strempek Shea, author of Selling the Lite of Heaven Helen Peppe's Pigs Can't Swim is an unruly, joyous troublemaker of a book. Her descriptions of rural working-class life are neither romantic nor squalid, and her observations of people would be devastating were it not for the generosity and mercy of her gaze. Reading about the life that produced this remarkable writer, we come face to face with our own joy, sorrow, anger, and resolve. <>Pigs Can't Swim is all that a memoir can be at its best: a clear-eyed, big-hearted testament to resilience, a rediscovery of what matters, an ode to life.